President Bush has remained characteristically quiet during President Obama’s first term. It used to be the norm and is demonstrative of his class. This despite the constant whacks the young President has been taking at his predecessor, apparently in the name of deflecting criticism and bolstering his falling poll numbers. But, given the young President’s wildly liberal (and yes socialistic) policies, this billboard sums up beautifully how many of us feel. Via John Hinderaker over at Powerline. 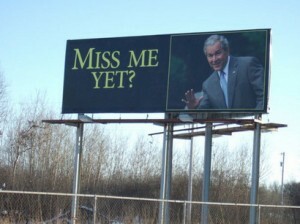 This is billboard in Minnesota, and yes it’s real. But the realy funny part of the story is how it was treated by NPR. John reports they are baffled. Go to Powerline to read John’s take because … well … he’s right. I am not so partisan to believe that more and more people, disenchanted with the Obama’s far left agenda are suddenly wishing for the return of President Bush, but given the direction Obama is taking the country, yes, I do long for the good old days. UPDATE: Here’s video of CNN’s coverage of the billboard, via Jim Hoft. One more thing. This current President has become famous for striking out at people who can’t strike back, leveling criticism at public officials and others in venues that don’t allow his opponents a chance to defend themselves. He has used this to his advantage in going after “W”, but Bush is not his only target. The Supreme Court episode, Fox News, The Republican confab, even reporters covering his staged events. I offer these two audio bite’s from CNN’s Reliable Sources from last Sunday. The reporter talking is Chip Reid of CBS News. I don't much miss W… What I DO miss is separation of powers. This mess just proves the founders were genius. I do miss George W. In fact, (never thought I'd say this…) I miss Bill Clinton! At least he had sense enough, or was political enough, to reverse course when the natives got restless. Of course, I am speaking of lesser of evils. It would be nice to elect a President who actually believes in the Constitution and has the backbone to uphold and defend it. Clinton was a Progressive but got the economy right. I guess I would prefer him also. The biggest issue still is separation of powers and we know that Obama is trying everything in the progressive handbook to undermine the constitutional separation of powers. GWB was not exactly a strict follower of the constitution either.